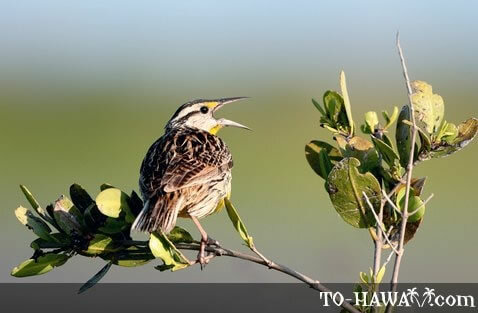 The Western Meadowlark can be found on Kauai only. It was introduced from the western United States in 1931. Adult males and females look similar. They have brown upperparts with black and white streaks and yellow underparts. They forage on the ground and feed on insects. Nests are also built on the ground and between three and seven eggs are laid. The young birds sometimes leave the nest before they are able to fly.